Well, most of us use WordPress as a CMS for the purpose of Blogging. But how many of us have really worked on Decreasing our Load time ? Load time is an important aspect of any site. The more the time a site takes to load, the higher are the chances of your visitors exiting your site even before it loads completely. 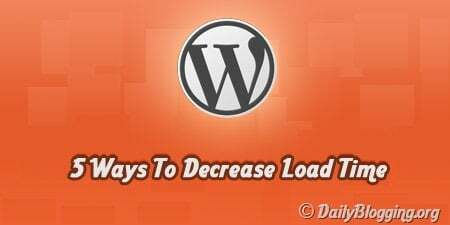 It’s very important to Decrease load time as it also has an effect on your Blog’s SEO. If you notice your Blog’s Installation Directory; you’ll find that WordPress as it comes with a large number of PHP Files. Moreover, if you add more lines of codes in your Theme files, then the load time of your Blog will decrease to a greater extent. Let’s quickly see the 5 Ways which will help you in decreasing the load time of your Blog. The first and foremost thing a blogger needs to look out for, while optimizing his blog’s load time is to reduce no. of HTTP Requests. Social Media Widgets which (with Counts enabled) usually are the root cause of Decrease load time of your blog. Yes, we need to keep widgets for our readers to vote up/share. But just try to limit them, because each widget will require to call that particular site’s API leading to increased HTTP Requests. You can use the W3 Total Cache Plugin for this purpose. It’s also important to reduce the no. of lines or comments in your CSS File. Use a CSS Compressor for compressing your CSS Files. Sprites are nothing but a collection of images, which can be called at a particular area in a site using various CSS techniques. The stand out feature of CSS Sprite is that, they help in reducing the no. of HTTP Requests. The Disadvantages of Sprite is that, the images cannot be repeated. Take a look at the Sprite Image we use on DailyBlogging. The Sprites concept may seem to be confusing before you start. You need to practise it a bit, if you want to master it. Here is a detailed tutorial on Sprites. It’s very important to cache your content, theme files, etc. Caching helps to load the files, content quickly; thereby decreasing your load time. I would recommend W3 Total Cache plugin for the purpose of Caching. Now some bloggers may even be using WP Super Cache, which is also a good alternative. I will soon come up with a Detailed Comparison between WP Super Cache & W3 Total Cache. I haven’t mentioned one important point i.e. To Use Less Number of Plugins. That’s because everybody knows that. You can take a look at the Top 10 WordPress Plugins I use on DailyBlogging if you want to reduce the no. of plugins & thereby decrease your blog’s load time. Have you got some additional tips to add up to the above 5 ? Today, cache plug-in is one of the great path to decrease the load time and content fastly. And, it’s one of the good support for all the blogger. Thanks for a lot for sharing your informative article on here, Mani. Thanks for sharing. Page load time is such an important factor to online success. With so many other options out there, people don’t have the patience to wait for your page to finish loading. Yes, you are right Nick. People just don’t have the patience to wait for few seconds. But we can’t really blame then. As Developers we need to use techniques to speed up a site/blog. I can never read enough of these posts. I am constantly trying to see how to speed up my site as it plays a huge rule in visitor experience. Aj Clarke, you’ve raised a valid point about the hosting here. They do play a vital part. Wish that you hit that target of 4K visits soon enough. I have to start using CSS sprites. Nice tips. I haven’t did any of these five so far. Personally I am not much interested in cache plugin as it sometimes interferes with feeds. You should try & implement the CSS Sprites Technique. I don’t think Cache interferes with your feeds. Try W3 – Total Cache. I haven’t faced a single problem till now. Well Using a Good cache plugin like W3 Total Cache won’t require you to use CSS Compressor because when you enable compression & the minify function on the plugin it’ll send the output of css in the compressed form. well triied w3 total but ut broke my theme so had to go with wp super cache.also had to install minify plugin ….just had a question, if i use this css compressor can i do away with this minify plugin ? i.e. it will help me in getting rid of one plugin ? Nice article mani…but i want to know how to decrease the http requests my social media plugins makes? I’ve just migrated to Word-press. However, I have a number of people who have subscribed to my feeds from my blogger blog. What should I do to ensure that they now receive updates from my Word-press blog.Thanks. If you were using FeedBurner as a tool for RSS Subscription then you don’t need to worry. Because feedburner is a third party service and host migration won’t have any effect on it. Just make sure that you provide the right url for your visitors to subscribe to. Well W3 Total Cache includes all the cache i.e. it also contains Database caching within it. I dont Recommend use of Total Cache Plugin. I have used it and after 15 min it has Broken my Blog. I personally Recommend to use Super Cache Plugin. Using a CDN service is another way to improve the loading time of our blog. I tried some services and now the loading speed of my blog is just over 1s. Some also optimize the content for us, so we don’t need to worry much about the problem now. Thanks a lot for this great article..
Super Article for beginners in wordpress. thanks mani . 1. Disabled wp-cron entirely and now i am running it once a week. 3. W3TC is one of the best plugin i have seen for caching although super cache is also cool. 4. Don’t forget compression, minify settings in W3TC. 7. Try to optimize for first load rather than second load time (as that’s probably cached).